I love the looks of this watch-it is very different- but the closure is somewhat difficult and the two tones of the metal do not stand out as shown in the ad. Being a Steiner I expected perfection.That said-I wear it daily and enjoy it. 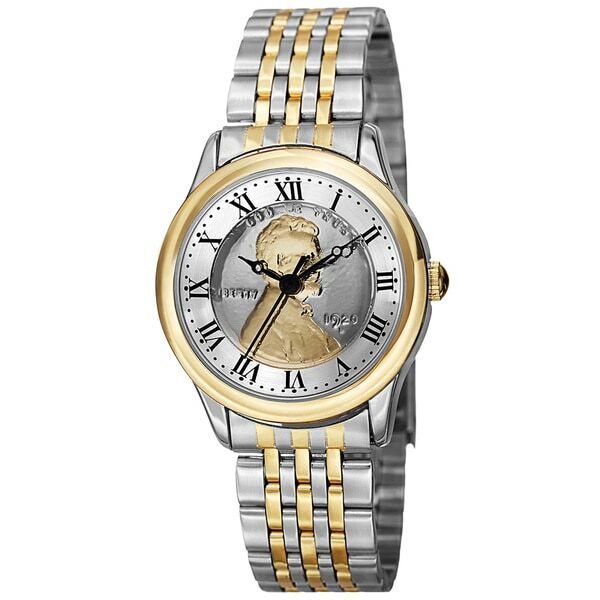 This collectors' August Steiner women's watch features a matte dial with two applied wheat penny coins at center. A unique case back with engraved "one cent" wheat penny creates a positively exclusive piece. The reliable movement will not let you down. Good looking watch but not too much two-toned. Looks mostly silver, you have to really focus to see the gold plated in the watch. Really large band. Loved the look of the watch. However wore it 1 day and the band broke on it. Then I was charged *** for return shipping. So this watch was not worth my money time or effort.